Lance Marell Briggs was born on 12 November 1980, in Sacramento, California USA, and is a former American Football player, best known as a linebacker for the Chicago Bears in the National Football League (NFL). 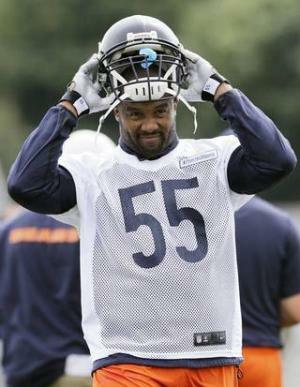 So just how loaded is Lance Briggs now? According to sources, Briggs has earned a net worth of over $12 million, as of early 2017, been amassed during his football career which began in 2003. Briggs grew up in Sacramento, and attended Elk Grove High School, California, where he was a three-year letterman in football and a two-year letterman in track. He later enrolled at the University of Arizona, majoring in sociology and joining the school’s football team, the Arizona Wildcats. Playing as the team’s linebacker, Briggs was selected first-team All-Pac-10 Conference twice, and was named team’s Defensive MVP in his senior year. He finished his college career having played in 33 games, with 308 tackles, 10.5 sacks, 36 tackles for losses, 3 interceptions, 10 passes deflected, 5 forced fumbles and 4 fumble recoveries. Briggs was subsequently selected in the third round, as the 68th overall pick, by the Chicago Bears in the 2003 NFL Draft. The following year he made 126 tackles and was selected as an alternative player for the Pro Bowl. In 2005, the team chose him to represent the National Football Conference in the 2006 Pro Bowl, however, he got involved in controversy by choosing not to attend the Bears summer camp, and was temporarily suspended. After an outstanding performance in the 2006 season, Briggs was selected for the 2007 Pro Bowl, but this time he was forced to turn down the invitation due to a foot injury. After the 2007 playoffs he became a free agent. Shortly after, the team placed the franchise tag on him, signing him to a one-year contract worth over $7.2 million. His net worth was again boosted. However, the player soon became dissatisfied with the team’s organization, expressing his unhappiness publicly in the “Mike North Morning Show” and in various interviews, demanding to be traded to another team. However, despite all this, Briggs re-signed with the Bears on a six-year, $36 million contract in 2008, significantly improving his wealth. Then in 2011 Briggs again demanded a trade, still having three years left on his deal with the Bears. Reportedly, this happened due to the Bears’ refusing to give him a raise. Although he was selected for the 2012 Pro Bowl, he didn’t participate in it, due to an ankle injury. That year, his deal with the team was increased through 2014, but the player suffered injuries twice during the 2014 season, which caused him to miss several games, and the following year he retired from football. Throughout his 12-year career with the Bears, Briggs recorded 1,139 tackles, 15 sacks, 15 interceptions, 18 forced fumbles and six defensive touchdowns. He was voted to seven consecutive Pro Bowls, just the fourth linebacker in franchise history to achieve this honor. This enabled him to achieve worldwide popularity, and to amass a sizable fortune. Speaking about his personal life, Briggs has three children with three women, but apparently remains single; he has often been involved in controversies and legal suits regarding child support. The player is involved in philanthropy; he has founded a non-profit organization called Briggs4Kidz, focused on raising awareness and funds to help underprivileged youth.